This is what you see when waking before sunrise for an epic XXL session, Nazaré, Portugal. Vasco Ribeiro the WSL 2014 World Junior Champion get's ready for another winter surf session at Guincho beach. Alex Botelho's eleven foot board enjoying Nazaré!!! Garrett McNamara and Nic Lamb preparing for the biggest paddle session ever at "Praia do Norte" Nazaré. 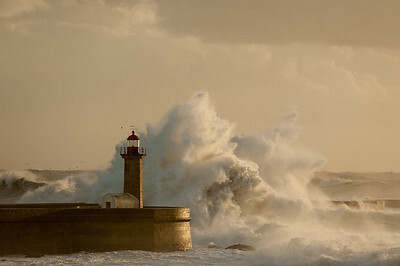 Its just so powerful, the spray and the white water of the waves comes close giving the people a unique show of mother natures raw power, the cliff, Praia Norte, Nazaré, with nearly 100metres, imagine it live and in colour. Elohe Ali Alvarez playing concertina with his best friend in his living room after a great session of airs in his home break Matosinhos. Omnipotent. Omnipresent. Omniscient. He is all-powerful, all-present, and all-knowing. Alex Botelho diving deep. How long do you think he can hold his breath? Only a surfer knows the feeling of a night sesh. My friend and surfer Elohe Ali Alvarez this time went to meet Doris. The blue hour is a period of twilight in the morning and in the evening, during the civil and nautical twilight phases, when the sun is at a significant depth below the horizon and when the residual, indirect sunlight takes on a predominantly blue shade.